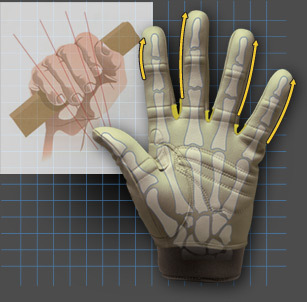 Bionic Technology - Pre-Rotated Finger Design | Bionic Gloves | SUPER. HUMAN. PERFORMANCE. Your fingers are pre-rotated, which means the forefinger and pinky rotate inward toward the center of your hand when grasping an object. Unlike conventional gloves, which are designed with a straight cut in the fingers, Bionic gloves feature a pre-rotated design that follows the natural motion of your fingers. Bionic is more comfortable, feeling like a second skin, and moves more naturally when gripping.